Independence Day is right around the corner, which means Fourth of July festivities across the country will be exploding with dazzling fireworks and roasting with wholesome barbecue. But if you’re looking to set your celebration apart as the best on the block, there’s no need to resort to buying the most expensive fireworks or having the most festive décor. 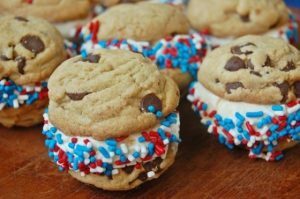 You can look no further than serving some of these particularly patriotic treats to your party guests. After all the hamburgers and hotdogs, anyone with even the slightest sweet tooth will come clamoring after these treats. 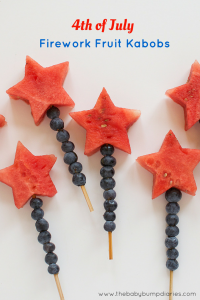 Plus, they make the perfect poolside or firework-watching snacks. 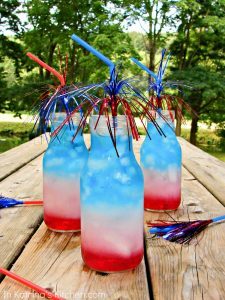 This punch is festive, refreshing and will pair perfectly with your 4th of July BBQ. 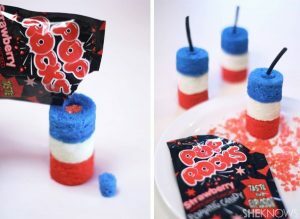 These cracklin’ cakes are a tasty alternative to actual firecrackers and they’re sure to make the kids’ faces light up! 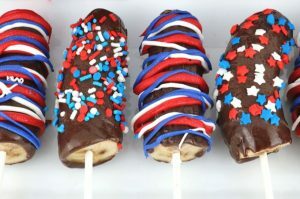 The chocolate and banana combo might not be for everyone, but this fun treat is a unique alternative for those looking to satisfy their 4th of July sweet tooth with something out of the box. 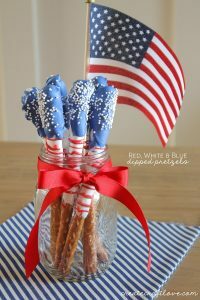 Put these decorative snacks on a plate for everyone to devour, or in a jar for some patriotic flair. Some people use holidays as an excuse to eat outside of their diet, but if you want to stick to yours, these festive fruit kabobs are the perfect choice for satisfying any sweet cravings (or temptations). Homemade mini ice cream sandwiches come together in minutes and are a huge hit with kids. If they can work fast enough, you can even let them build their own. Just don’t forget the red, white and blue sprinkles. 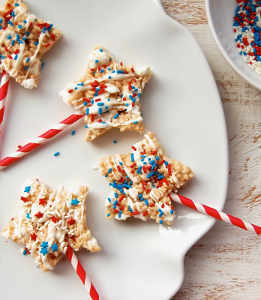 Not even the fireworks will snap, crackle and pop like these patriotic Rice Krispie pops! 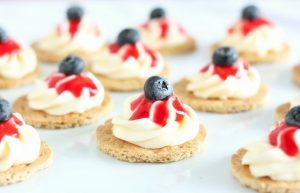 One of the simplest, yet tasty treats on our list, these No Bake Cheesecake Bites fit the 4thperfectly, but can be adopted for almost any other celebration with a little creativity. 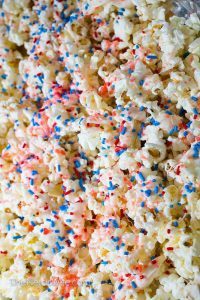 This Firecracker Popcorn has just the right amount of sweet, salty and fizz to add some spark to your 4th of July Festivities! Your guests may panic when they see these babies sitting out in the heat. 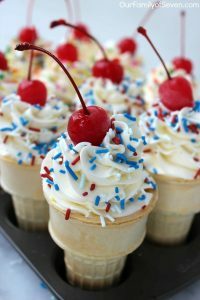 But no worries, these ice cream cone cupcakes combine the joy of eating both cupcakes and ice cream, without the melting. That’s the real cherry on top.